Vancouver Transit Authority Plans to Run Open-Loop and Closed-Loop Fare Collection Side by Side | NFC Times – Near Field Communication and all contactless technology. 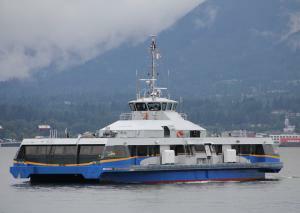 Vancouver-area transit authority TransLink launched open-loop collection of fares on trains, buses and ferries in May. Usage remains modest, though not insignificant. As of late July, two months after the authority launched the service enabling riders to tap their contactless EMV credit cards and credit card credentials in NFC wallet to pay fares, 160,000 unique customers had used the service for a total of 1 million fare transactions. That is a relatively small amount, though perhaps not an insignificant rate of early adoption for a transit system that sees an average of more than 20 million journeys per month on its trains, buses and ferries. Total journeys in 2017 totaled 247 million for the full year. And it seems the open-loop fares payments will remain in the minority for some time to come, with TransLink’s closed-loop Compass Card continuing to account for most fare payments. TransLink offers discounts to Compass Card users, and it has no plans yet to extend these discounts to users of contactless EMV cards and NFC phones, a spokesman told NFC Times.